Converted from F1 version . Hundreds of textures where made from scratch but ofcourse many were not. 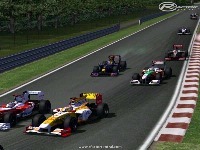 -ISI for the Skybox, Grandstand and 3d trees objects . -Gilles Benoit for the cameramen and trucks. -James Burroughs for the TV Crane. Special Thanks to Hane for making the cameras,track and startlights work. known bugs: Tyrewalls are non collidable. Please email us if you can fix this. Exact same problem, that happens when you take the rumble strip right? There is a weird bug on the track surface, a strange bump (or crack) between turn 14 and turn 15 that sometime makes the car to hit the ground violently and stopping suddently! Very frustrating... Someone have the same problem? Is there a solution? Edit: I think it happens when you go on the rumble strip at the exact same place, that rumble strip is buggy... Can't use a proper racing line with this. Open BELGIUM.SCN file located in your F:\rfactor\GameData\Locations\Belgium\Belgium folder. Keep in mind your rfactor install is different than mine. This track has good textures and details. The sky image is screwed. I have a new ISP with higher download allowance so i took dummy's friendly and helpful advice and downloaded this track. I can now answer my questions for other people. The track uses the F1 pits and it is a very recent ('00s) version of the layout. why not... its gotta be easier for you to down it and have a look for yourself than to ask such questions?? Some poeple have a limited download allowance and don't want to waste it downloading something that's just like what they already have. What year is this version based on and does it have the Touring Car pits or F1 pits? These are simple questions, can someone please answer them? I already have Spa 1988, is there any reason to download this as well?